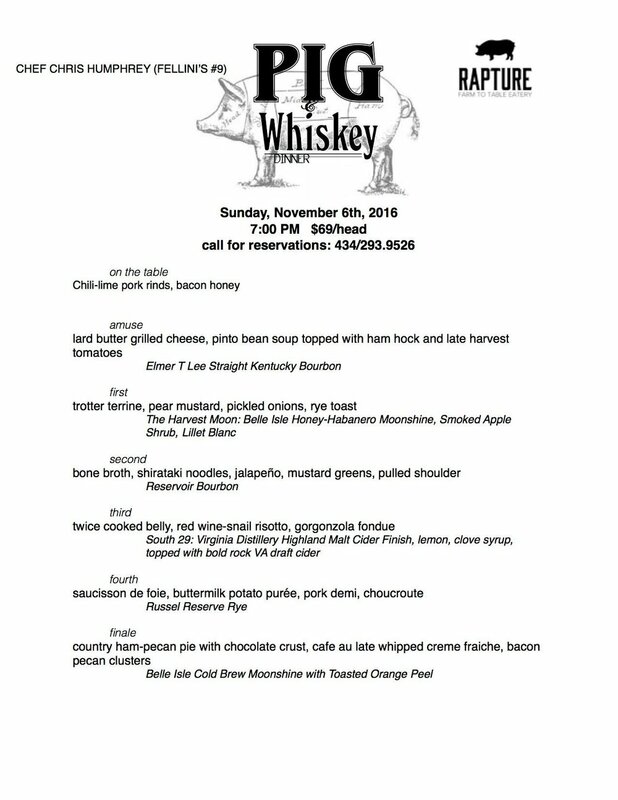 PIG & WHISKEY DINNER: SUNDAY, NOVEMBER 6TH @ 7:00 PM. Chef Chris Humphrey returns to Rapture for one night to keep the tradition alive! Call for reservations and get your seat NOW!!!! In the nearly 6 years that Rapture was graced with Chef Humphrey's culinary wizardry, one of the most memorable, fun, and delicious events that he created was the annual Pig & Whiskey Dinner. We're so excited to be collaborating with him again, for the 7th rendition of this feast! The entire menu is featuring Autumn Olive Farms Pork. Sunday is also Daylight Savings which means we get an extra hour of sleep so there is no excuse to miss this! The dinner is only $69 per person!! You won't find a better deal on a 7 course dinner complete with bourbon pairings. Limited amount of guests so call and make your reservation today.